When it comes to having a smarter house, most people’s thoughts soon turn to lighting. Having lights that turn on or off on a schedule or when you enter a room or your garage are wishes that are pretty high on people’s wish lists and aren’t that hard to do. Tech-savvy users might want colorful lights that can convey information or just provide a not-so-subtle wow-factor. But getting from dumb incandescent bulbs to one of these setups is a bit more complicated than just replacing a bulb, or a switch, or an outlet. I have 45 light bulbs in my house, not counting two fancy fixtures with equally fancy bulbs. While the idea of replacing all of them with a $60 connected light bulb that can change colors and be controlled individually makes my head hurt, there are certainly places where having a smarter light bulb can offer a lot of value. Right now you’re probably jumping ahead and wondering which connected light bulb, or what features matter, but pause for a moment. Before we start talking about bulbs and features, we first need to talk about location. Because once you decide to bring connected products into your home you’re going to spend either time and money (or both) on the product, which means you’ve got to think about where it makes the most sense to put them. Who spends time in this room? How much? What do people do in this room? Can you see this room from the outside? Would I like to avoid my computer but still get info in this room? These are good starting points as they help me think about the features I’ll want and even if connectivity is worth it. For example, bathrooms seem like a lame place to put colored lights, which tend to cost more, because I typically want the most natural light. It may not even make sense to even add connected lights, when replacing the switch with something that might be on a timer makers more sense. My living room with red Hue lights after the Cardinals score a point. When it comes to colored lights I think the family room or my kid’s room is a good place as well as my bedside table lamp. Those are places where I like having dance parties and access to ambient information (i.e., my light will change color in response to a schedule or something happening on thew web). As for whether or not a room is visible to the outside, this is helpful for security purposes. I might put a connected light in one of those spots for when I’m away on vacation. Based on these thoughts, I’ve come to some conclusions about where I need to use connected bulbs, versus connected outlets or even wall switches. In some cases I might not even connect anything, although I’m eying these Lutron occupancy sensors for my closet and laundry room, where I don’t need connectivity but I’d love to save electricity. But let’s get to the lighting options, shall we? This is by no means an exhaustive list of available lights, but rather a sample of the popular lights that were on the market for me to test over the last few months. There are a variety of coming lights that offer some interesting features — such as Bluetooth speakers or even algorithms that learn your lighting habits and respond before you have to manually flip a switch — but they weren’t available for me to try. So here’s what I did try, and I’ve gathered some thoughts about them. At the end I also included a table comparing the bulbs and various features. Products it works with? – Hue and Lux: SmartThings,Wink, Staples Connect, HomeKit, Logitech. These bulbs have been out on the market since October 2012 and are probably the most familiar to people. With a growing family of products including the colored Hue lights ($60 per bulb) and the white-only Lux lights ($30 per bulb) the Philips lights have an incredible app ecosystem that lets you tie these lights to your activity trackers, your TV, your email or whatever else you want to link the lights to. However, depending on the platform you use to connect your Hue lights, you may get different features. 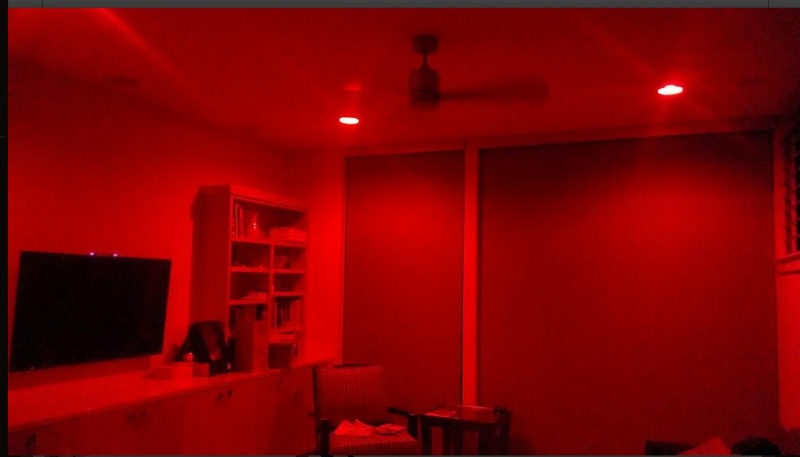 For example, with IFTTT, you can’t control the lights as a single room — only individually unless you’ve set them up as a group inside the Hue app. The Wink hub won’t support control of Hue lights remotely, and the list of variances goes on. There’s one other issue with the Hue bulbs that drives me nuts (outside of a lackluster app interface): when you remove a bulb you have to reset your hub, which eliminates all your existing lights and programming. This is not just stupid; it’s a deal killer if you want to do your entire house in Hue bulbs. I’d also like to see improvements to the grouping features to make creating rooms easier. That said, the addition of the Hue tap wall switch and the ease of use make these an easy to use product for pretty much every one. Yes, they are expensive, but they are constantly improving and remain an excellent choice for someone who wants to add an array of connected and colored bulbs to her home that will work with a huge number of platforms. These bulbs were my eight-year-old daughter’s favorite, but at $99 they were also the most expensive. That’s because they have both all the colors, including the elusive blue that the Hue lights can’t offer, and they also don’t require a hub because they have built-in Wi-Fi modules. They were also heavy. In one of my test lamps, the bulb weighed down the goose-necked lamp so much it bent forward to touch the table. For now you can’t control the LIFX bulbs remotely, but that should change some time next year. Much like the Hue, I’d also like to see improvements to the grouping features to make creating rooms easier, but I guess these are party lights, not practical lights. The bulbs have AllJoyn, which means they will work with other AllJoyn devices eventually and LIFX is a Nest Labs development partner as well. They also come with some lovely features, such as a lava lamp function in the app that cycles through a variety of colors — things you have to get with other apps in the Hue bulbs. All told, I liked these lights, but they were the largest, heaviest and most expensive, which means they were a tough sell. But with the Wi-Fi only, most colors and prettiest app they also had the highest-end features. If they had remote access I’d buy one for my kid’s room or the bar. These are white-only lights for $30 a bulb, and I liked them because they are lightweight and provide a nice, even quality warm light. They also have a hub (a starter pack is $99 for 2 bulbs and the hub), but it plugs into an outlet instead of your router, which leaves a free port on what is becoming some valuable real estate in my home. The TCP lights and the Philips Hue and Lux lights are not so considerate. The WeMo lights work as part of the overall WeMo ecosystem of products including a camera, an outlet and a wall switch. This is nice, because if you have the wall switch it means your lights can be controlled from the app even if they are “turned off” at the switch, something that happens all the time at my house. You can also use the motion sensor to turn on the lights through a little programming in the app or through some fancier programming via IFTTT (but you can only control the bulbs indirectly through the switch) and other smart home sensors. This is where the openness of the WeMo platform is a plus. However, while scheduled events with the lights (turning on and off) worked fine in the WeMo app, things like dimming did not. Instead of a gradual dimming over a period of 30 minutes edging toward bedtime we ended up with a sudden loss of light at the final minute after the light reduced its output by maybe 5 percent in the 29 minutes prior. Also, programming the gradual dimming was pretty counterintuitive. Instead of programming the time you wanted the light to go off it appeared that you were supposed to program the start time for it to begin dimming. Sometimes mine would reset, but perhaps I was just tired. But if you have a WeMo home and simple needs these are relatively inexpensive lights. I did hear a slight hum from them sometimes when they started up. You could however, lump your WeMo lights together and control them as a room both within the app and when working with third-party apps, which is handy. At $15 a bulb these are the cheapest connected bulbs you can buy, but they are also the least feature rich. You can’t adjust among a palate of white, you can just dim the bulbs and set schedules for them. But with connected outlets running $30 to $50, buying a $15 bulb for a single lamp is still cheaper provided you already have the $50 Wink hub that’s required to work with the light. The light quality is similar to a yellow incandescent; very warm and homey, as opposed to the whiter light offered by many of the other bulbs I tried. There’s also no hum when starting up as I could sometimes hear with the WeMo. But, if you’re doing a light fixture with four bulbs, I can’t really see a lot of value in using smart bulbs as opposed to just replacing the wall switch. It would cost less and also add dimming capabilities. The primary value is if you are uncomfortable working with electricity, I suppose, but a four-bulb fixture would cost $60 to replace those bulbs while a wall switch could run you $40 to $50. Thankfully, the Wink app is easy to use and program so things like scheduling are a breeze once you get the bulbs paired. You can also group bulbs by fixture, by room or by any other grouping you’d like (such as lights to turn on when I’m away). I will say; once again, I’m the type of person who likes having a connected switch for my connected bulbs simply because I don’t want to open an app every time I want to turn my lights on an off, which makes me once again recommend investing in either a connected switch over these lights or going whole hog on the wink system and putting in the $300 GE Wink Relay switch. But then you’ve totally killed the cost value of the $15 bulbs. The TCP lights are two different colors A19s are on the left and the BR30 is on the right). These Connected by TCP lights have been around for quite some time and come in a wide variety of different bulbs, from the normal A19s that you pop into lamps to the type of downlights you might find in a shower. 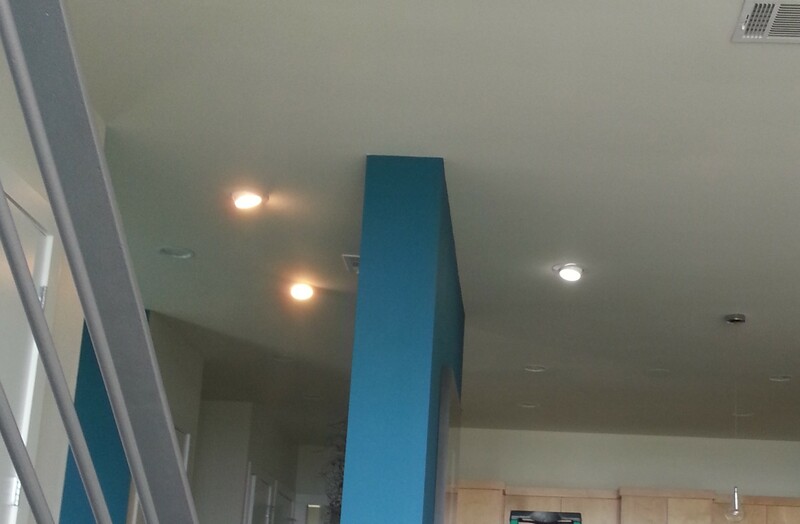 Most of the above lights only come in the A19 lamp style although the colorful Hues also come in BR30 bulbs you find in can lamps embedded in ceilings in higher-end homes. I wanted to loves these lights, and they function well, but in my test of the BR30 can lamps and the A19-style the lights were different colors, which were awkward. And since these are dimmable, but you can’t adjust the colors of the white light, I was stuck with the different shades. The app was functional, allowing me to group lights by any category I wished and mark that grouping with a photo that I took on the spot. I could also link it to SmartThings sensors to set up more complicated automations. However, the app wasn’t beautiful by any stretch of the imagination, so any design conscious consumer wasn’t going to be playing with this in his or her spare time. You could set schedules and control the lights from the app, and they worked. The lights also worked, albeit in different shades. The hub was not attractive, but since it was in a closet I didn’t mind, and for $80 for a starter package and a range of $20 to $40 per bulb, this set is about bringing smarter bulbs to your home at a reasonable price point. But you can still brag to your friends about the cool light show you can put on. As you can see, there are many options (I didn’t even cover the many new designs coming that have speakers or more algorithmic approaches to lighting) and ways to get from todays boring old bulbs to tomorrow’s LED lighting of the future, but hopefully this guide gets you thinking about the how you want to get there without spending too much time and money heading down the wrong track. When in doubt, bet on openness and spend for color only where you think you’ll use it. Updated: This story was updated on Monday Dec. 1 to correct some misinformation about Hue Lux pricing, lumens and support for IFTTT in the chart. 1. what do you mean by “remote access” when you telling that Lifx lights don’t have it? 2. will Lifx lights work well with 220v electricity? It might be worth pointing out that the Belkin and GE Wink bulbs are standard ZigBee LL with HA fallback, i.e. unlike the Philips bulbs, they can work with most home automation gateways that support ZigBee bulbs/lights. GE Link works great with my SmartThings hub. Good summary! The average homeowner will only do a few lights. To go whole house, the average price of your home (45 x $25 = $1125) seems within reach. Most of these bulb makers will go out of business in a few years so picking a winner is risky. Another approach to consider is low voltage and DMX. The high cost of the LED bulbs in your review is due to the voltage converter and radio inside each light. DMX is a well known technology for lighting control with a distributed control bus and injected power.Think stage lighting or elaborate Christmas displays. I can get a string of 150 lights for $20 or single modules for 20 cents. If you connect these to a low voltage power supply (< $25) and a data line connected to a controller ($20-100), each bulb can be individually controlled with color and brightness settings. I know this is a stretch for the average home owner, but for hobbyists and tech geeks you get the most flexibility. There are plenty of free software programs and inexpensive Arduino type boards to control the circuits and interact with your computer. I would like to see one of the up and coming IoT venture funded companies embrace this well established protocol and offer products for those willing to more or less rewire their houses using low voltage techniques. This is actually the norm in boats and RVs. Another cool trick allows these lights to run from common 5V and 12V batteries, possibly fed by solar powered battery arrays. It would sure be handy to have this during the next hurricane Sandy or other lengthy outage. I can’t believe that you overlooked the IRIS products offered nationally at Lowes. Probably because its an article about smart bulbs. IRIS doesn’t make any smart bulbs. IRIS is a smart hub. Astro is redefining the smart home experience by creating plug-and-play devices that require no installation and no new infrastructure. Theirr first product line, Twist, is a series of three devices, each of which takes on the form factor of a lightbulb. Through this platform they are able to deliver wireless lighting, wireless hd video cameras, and wireless speakers, that are just as easy to install as a lightbulb. By leveraging the ubiquitous light socket in peoples homes, they are able to make affordable, accessible smart home devices that only require the purchase of a single product to get started. No hubs, no wires, and no new wireless networks. Their patent-pending system ties together a variety of wireless protocols to deliver latency free control over the devices in your home. Each of their products contains Bluetooth4.0, BluetoothLE, and WiFi, and screw into existing lighting sockets enabling an expandable, end-user installed experience. Wow, another light bulb review article with no mention of Color Rendering Index for each bulb?! That is the most important criteria. George, the CRI is printed on the boxes, but when I asked about features people cared about no one mentioned CRI. It seems like a niche lighting thing, so I didn’t include it here, but I understand that some people are very passionate about it.